As an international expert in the documentation of torture according to the Istanbul Protocol, Dr. Hamzé partners with PHR in its work in Iraq, where she provides training on the forensic documentation of psychological evidence of torture and sexual violence. Dr. Hamzé has documented numerous cases of torture, many of which have been submitted to court processes, and recently testified before the Eastern High Court of Denmark in cases relating to torture in Iraq. Her long-standing experience with primary and secondary victims of violence and torture has inspired her to develop an innovative Family Therapy Model, uniquely tailored to this population. Since 2010, Dr. Hamzé has served as trainer and mentor for the psychological, clinical, and forensic documentation of torture at several international conferences in Central Asia, Europe, and the Middle East. 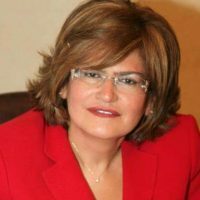 In 2013, she was appointed professional trainer in “Capacity Building for Law Enforcement Personnel in Lebanon” for the documentation of torture according to the Istanbul Protocol. In 2016, Dr. Hamzé was elected vice president of the International Rehabilitation Council for Torture Victims for a three-year term.